You know what happens when you have a cookout or picnic. Inevitably a couple of kids get finished first, then cause havoc being kids or just exploring while you’re trying to encourage the rest odd the group to eat. But what if you had something simple in your pocket. …literally? That’s what appealed to me most about Fundanas , educational games and outdoor resources that you can fit in your pocket, on your head or any place else you’d wear or hide your bandana when outdoors. 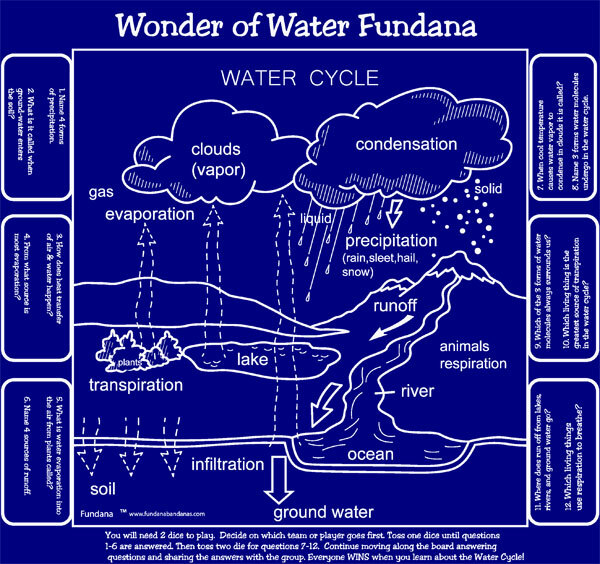 Fundanas, created by educators, have been around for more than 15 years, but I recently learned about this resource for our girls. We recently checked out a glow in the dark constellation Fundana, as well as a nature game and knowing your knots banana. And I really wish we had their new Wonders of Water bandana when we started our WOW journey as Brownies! The are more than 35 types of Fundanas, including Walk in the Woods for older kids-12-15, Star Quest, Beach Quest, Bug Bingo and Nature Quest. Each new bandana is field tested with other educators around the country. You can order several Fundanas on Amazon as well as well as see the complete collection on the Fundanas website. Fundanas also creates custom bandanas (such as with camp trail maps) for events or camporees. Disclosure: I did receive sample bananas but was not otherwise compensated for this post.